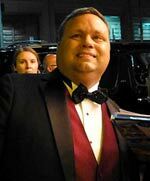 Paul Potts was born in Bristol 1971. For several years he worked as a shelf stacker in Tescos and tried unsuccessfully to make it as a full-time singer. He served as a local Liberal Democrat councillor on Bristol city council and in 2007 was working as the manager of Vodaphone phone shop. Since his TV performance, he has signed a record deal and become a well-known music celebrity. His first album ‘One Chance’ sold well, going to number 1 in the album charts in several countries. The life of Paul Potts is a real rags to riches story. Previous to appearing on “Britain’s Got Talent” Paul was dogged by illness and misfortune. For example, he spent most of his savings on receiving singing lessons, including taking part in a Luciano Pavarotti master class. This cost him up to £20,000 and although he was given encouragement he was never able to get a paid job out of it. In 2003 he had to receive hospital treatment for a benign tumour. Shortly after this operation, he broke his collarbone in a bike accident. He spent many months lying on the sofa in great pain. However, he was encouraged by friends to give the new ITV series a go. With little to lose and no high expectation, Paul auditioned and made it through various stages to the final. His first performance was in Wales at the Millennium Centre on 17th March. He sang a rendition of Puccini’s aria from Turandot. His performance ended with a standing ovation from the 2,000-strong audience. Even before he had won the final, he had been receiving much media interest. “I have done more things in the last four months than I would ever have expected to do in my whole lifetime,” Potts told Reuters in an interview. “It’s mind-boggling.” His schedule includes many performances and TV interviews – He has recorded a performance for Opera Winfrey.